July 11, 2014| Research results and advice from experts are available to both employees with assistance dogs and employers to help create successful employment outcomes. July 24, 2013 | New research initiative will support both employees with assistance dogs and employers. 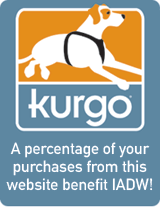 April 13, 2013| Get a 30% off deal on Kurgo dog products while helping IADW. August 7, 2012| New Assistance Dog Week Art Emblazoned on Products to Support IADW. August 6, 2012| In honor of International Assistance Dog Week, Public Radio reporter Matt Kelly interviewed event founder Marcie Davis. July 13, 2012| International Assistance Dog Week 2012 has an ad running in the July issue of Media Sponsor publication, New Mobility. August 11, 2011| International Assistance Dog Week and Guiding Eyes on the TODAY TV show. July 29, 2011 | International Assistance Dog Week 2011 has a new TV public service announcement. July 29, 2011 | International Assistance Dog Week 2011 has a new radio public service announcement. August 2, 2010 | Santa Fe, NM – Working Like Dogs is proud to announce that “Golden Girl” Betty White will be a special guest on the Working Like Dogs radio show on www.petliferadio.com in honor of National Assistance Dog Week, August 8-14. Finally, the Working Dog has His Day…and a New Website! June 30, 2010 | Santa Fe, NM – Annual National Assistance Dog Week celebrated August 8-14, 2010.